Proposed changes would send roughly 1,000 students now attending Four Corners and Eyre elementaries – two predominantly Latino schools in east Salem – to South Salem High School, a majority white high school in a more affluent part of town. Parents are concerned a Salem-Keizer School District proposal to ease high school overcrowding by shifting some students to different schools would lead to more bullying of Latino students and cause transportation headaches. District officials Tuesday night detailed their plans to shift the attendance boundaries for many Salem-Keizer schools, and change where some elementary and middle students will go to high school. Those changes would send roughly 1,000 students now attending Four Corners and Eyre elementaries – two predominantly Latino schools in east Salem – to South Salem High School, a majority white high school in a more affluent part of town. Currently, students from those elementary schools go on to North Salem High School. It’s about a mile closer than South, but parents say the distance between cultures is much wider. “I don’t want my kids to go where they’re not welcome,” said Aida Valenzuela, a parent of a Four Corners student. She’s not opposed to the change, but said she wants the district to send a clear message that racism from other students and staff won’t be tolerated. Adela Lemus, who has a son at Four Corners, said her older son attended South Salem and was looked at as “lower class” by fellow students. “He felt discrimination,” she said, speaking in Spanish. Her other children have all attended North. 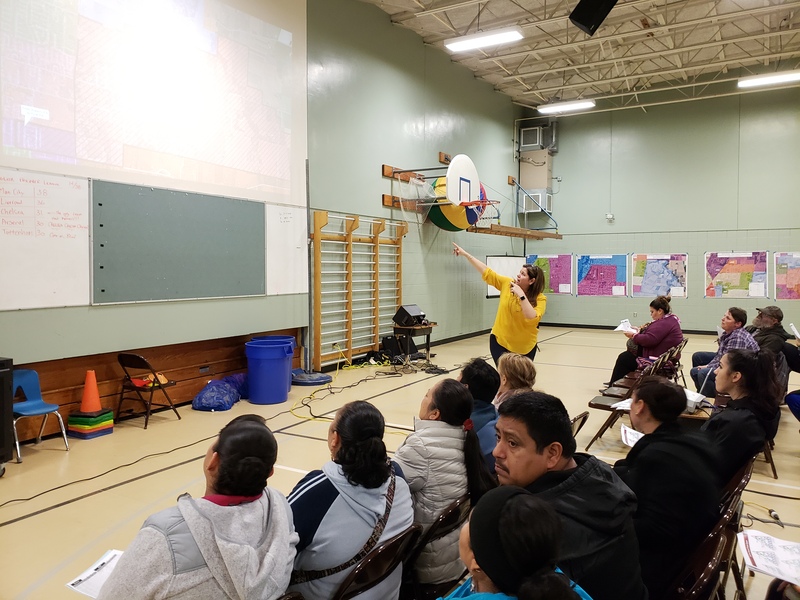 Several hundred community members attended a forum Tuesday night to learn about and weigh in on the proposed changes at Four Corners. The district held forums at the same time at three other schools. Discussion about redrawing boundaries began in September, when a group of dozens of parents, principals and interested citizens began tweaking an initial proposal based on projected population growth. The district’s goal is to head off future overcrowding at McKay High School and some of the schools feeding into it by shifting students to North and South. Public testimony during Tuesday’s forums will shape a final proposal for the boundary committee to present to the superintendent and school board in January. The board will vote on a plan in February, with changes taking effect next fall. Yadira Juarez, a member of the boundary committee who directs early learning programs for the Salem-Keizer Coalition for Equality, said she’s raised concerns about transferring large numbers of Latino students to majority-white areas. But the proposal now is “much better than before,” she said. Early discussions included shifting some students to Sprague High School, even further away. “We listened to this voice,” she said of the concerns parents had raised. Some families with students currently attending North Salem would reside in the new boundary for South Salem under the proposal. “We know that we can’t just uproot kids from classrooms and schools,” said Olga Cobb, one of Salem-Keizer’s elementary school directors in answer to questions about the plan. District policy allows student who have completed more than half their time at one school to remain at that school until finished. But typically, transportation to the old school is not provided unless the student has a disability. Parents said that policy forces them to choose between uprooting their child’s social life by moving them to a new school or finding a way to keep them at their old school without bus service. Because of the number of students impacted by the shifts, the district may consider exceptions to those policies, spokeswoman Lillian Govus said. That could mean allowing current freshmen at North to stay there rather than moving to South next year, she said, and possibly providing transportation to some families if it’s economical to do so.